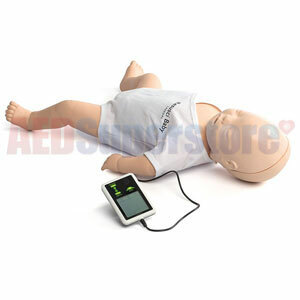 Realistic infant CPR trainer for optimizing student performance and skills. The Resusci Baby QCPR by Laerdal Medical. A realistic infant CPR training manikin with improved multiple feedback options to help students develop the skills necessary for learning infant CPR skills. It has been shown that measurement, assessment, and quality feedback are key factors in developing competency in performing CPR correctly. Students will learn how to open the airway as in a real-life situation to administer air to the infant effectively. The realistic head tilt/chin lift allows students practice the proper airway maneuvers used when resuscitating an infant. With the optional SkillGuide (device sold separately) providing real-time feedback on compressions and ventilations the student can improve their CPR performance better than ever. A sensor indicates correct hand placement for accuracy in delivering compressions. End of session debriefing is also possible with Resusci Baby QCPR with SkillGuide. Disposable non-rebreathing airways can be used by more than one student during class, and are easily changed after every training session. Reusable removable faces allows each student to have their own for mouth-to-mouth training, promoting easy clean-up and sanitation after class. Includes manikin, 2 face masks, 1 roll manikin face shields, disposable airway, suitcase, blanket, pulse bulb, manikin wipes, user guide, manikin battery. SkillGuide and SimPad SkillReporter sold separately. Replaces 14001101 Resusci Baby w/SkillGuide w/Hard Case.